Weight loss, when pursued intentionally to achieve physical fitness and/or health condition improvements is expressed in reduction of the total weight via loss of body fat and consequent reduction of lean mass and body fluids. Weight reduction occurs when the body is using more energy then it’s receiving nutritionally. Changing of life style – less sitting, more doing! The long term diet & physical activity management is most effective unlike short term crash diets. Short term excessive weight reduction often leads to rapid weight gain. The normal volume of intentional body weight loss is less than 1-2 pounds per week and depends on current body weight and skeletal size ratio. Wight reduction requires careful diet planning and an exercise plan. To maintain a reasonable health during the weight loss program, the calorie intake should be no more than 500 calories below the normal volume. The absolutely lowest nutritionally balanced calorie intake for healthy individuals should be 1500 for men and 1200 for women. It is important to keep in mind that intake of weight loss supplements and medication can lead to serious side effects such as malabsorption of nutrients, gastrointestinal damage and dangerous state of dehydration via electrolyte imbalance that may affect several organs. 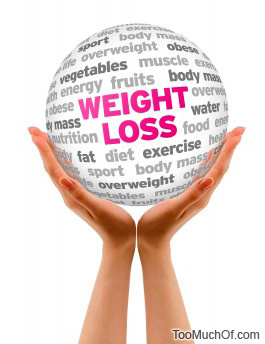 When too much weight loss occurs very rapidly, it may result in a vast number of serious adverse health effects. It is worth noting that majority of people who achieved a rapid weight loss will gain their lost weight back. This may occur even if the weight loss diet and exercise volumes are maintained at the same level. The weight reduction at any rate may also invoke long term chronic health problems to those with preexisting conditions. Therefore it is strongly recommended to consult with a doctor prior to initiation of any weight loss programs.